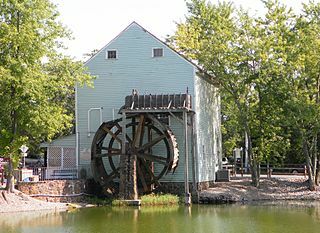 Reproduction of 19th century canal town with working gristmill, a general store, blacksmith shop, a canal museum, Lenape Indian village exhibit and several historic houses. Located on banks of 102-mile Morris Canal at half-way point of Canal which ran from Jersey City to Phillipsburg on Delaware River. After being closed for several years due to financial problems, re-opened in summer 2015 by state government for public visits, limited events, festivals and concerts. 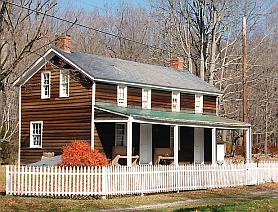 Located in northwest corner of state in Sussex County, origins date to 1832 construction of grist mill by local farmer Abram Gris along the newly-completed Columbia-Walpack Turnpike where it crossed stream known as "Van Campens Mill Brook." By 1875, village reached peak of 75 inhabitants and about 19 major buildings. From 1880 onward, population declined along with other rural villages. Garis mill closed around 1900, and by 1950, blacksmith only remaining business in town. In 1960's and 1970s, National Park Service, in preparation for potential construction of Tocks Island Dam on Delaware, relocated some buildings to higher ground at Millbrook, with some replacing original buildings that had been demolished. Village today has about same number of buildings as in 1900. On summer weekends, several buildings including museum, hotel, grist mill and church open to public, volunteers from Millbrook Village Society demonstrate crafts of era, including woodworking, weaving, basket-making. Founded 1766 by German ironmaster Peter Hasenclever who brought 500 ironworkers and their families from Germany to build an ironworks "plantation," which grew to include furnace, forge, houses, shops and farms. Dam at "Long Pond" (Greenwood Lake) on upper Wanaque River provided hydropower to operate blast furnace and large forge with two additional furnaces constructed in 1860s. Ironmaking ended at site in 1882 as industry converted to anthracite furnaces using Pennsylvania coal. Site houses remains of country store, furnaces, casting house ruins, charging areas, ice houses, waterwheels and other structures, currently undergoing restoration of additional buildings: Original Village of Hewitt built around Ironworks, with church, store/post office, schoolhouses, and dwellings and outbuildings for workers and managers, some of which remain intact or as ruins. Nonprofit Friends of Long Pond Ironworks offers tours on selected dates April through November, museum open to public on weekends and from April through November and by advance arrangement throughout year. 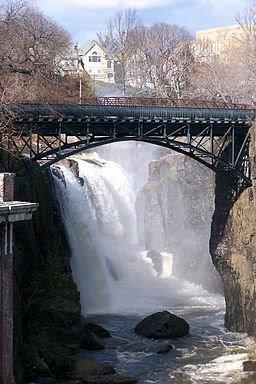 Paterson industrial heritage developed around harnessing water power from 77-foot high Great Falls on Passaic River, first visited by George Washington and Alexander Hamilton during Revolutionary War. After independence, Hamilton a principal in incorporating Society for Useful Manufactures in 1792, which purchased 700 acres surrounding Great Falls and built first water raceway in 1794 and opened first cotton mills. Society's efforts hampered by mismanagement leading to its dissolution, but before Civil War city emerged as one of nation's leading centers of textile, locomotive and iron and steel production. Also site of labor unrest among workforce of recent immigrants, particularly with famed Paterson Silk Strike of 1913 with strike leadership efforts centered at Botto House, now houses American Labor Museum. National Park dedicated in November 2011 as 397th unit of National Park System, plans to protect Great Falls at center of district with nearby mills and factories, along with exhibits of worker homes and family life. Area first settled in 1750s with commerce centered around construction of grist mills on South Branch of Raritan River, later served as stop on cross-New Jersey route from Elizabethtown to Delaware River. Other businesses included limestone quarries, tannery and surrounding farms. Town of Clinton incorporated 1865, branch line of Lehigh Valley Railroad completed 1881 into town. Clinton House Hotel across the road. 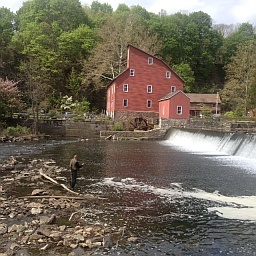 Town devastated by fire in 1891, rebuilt 1890s-1920s with Victorian shops and homes largely remaining today, Red Mill, on west bank of Raritan, now privately-owned Historical Museum and Dunham's stone mill on east bank now Hunterdon Art Center. Clinton House restaurant dates from tavern and stage coach stop opened 1830. Center of town added to National Register of Historic Places in 1995. Dates from 1822 founding of Howell Iron Works, Co, which established ironmaking town with general store, blacksmith shop, carpenter's shop, owner's house, bakery, foreman's house, church, and museum. Volunteers from nonprofit Historic Village at Allaire provide demonstrations of blacksmithing, other trades. Hosts more than 40 programs and events annually, including living history events, antique shows, arts and craft shows, and flea markets. Built originally in 1766 by Charles Read as Batsto Iron Works along Batsto River in Pinelands, used bog ore from river banks and wood from forests for smelting, acquired 1773 by Philadelphia business man John Cox, produced cannons during Revolutionary War for Continental Army, later household items such as cooking pots and kettles. In 19th century, shifted to glassmaking until abandonment in 1867. Land and buildings purchased out of bankruptcy in 1876 by Joseph Wharton, Philadelphia businessman and namesake for Wharton School at University of Pennsylvania, acquired by state government in 1950s. Current village comprises 33 buildings and structures, including Batsto Mansion, gristmill, sawmill, general store, workers' homes and post office (opened 1852, one of four oldest post offices currently operating in US). 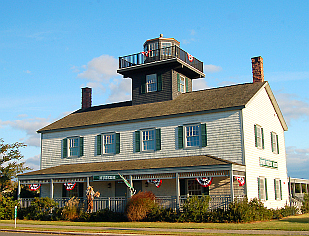 40-acre site on Tuckerton Creek re-creation of marine village with 17 historic and re-created buildings connected by boardwalk and wetlands nature trail features two houseboats, duck decoy workshops and gallery, working boatworks building, historic marine railway, decoy carving workshops and recreated Tucker’s Island Lighthouse. Formerly known as Barnegat Bay Decoy and Baymen’s Museum, also home to Jersey Shore Folklife Center which researches and preserves traditions of Jersey Shore and Pinelands. Volunteers demonstrate work of decoy carvers, boat builders, basket makers, quilters, commercial fishermen, artists and other baymen and women. Programs include workshops, tours and classes taught by Jersey Shore artists. Tucker’s Island Lighthouse exhibits on privateers and pirates of Jersey Coast, founding of US Life Saving Service and local shipwrecks. Jacques Cousteau National Estuarine Research Reserve Interpretive Center housed in Tuckerton Yacht Club at seaport, managed by Institute of Marine and Coastal Sciences of Rutgers, conducts scientific research and hosts education and interpretive programs. Operated by nonprofit Tuckerton Seaport, Inc. 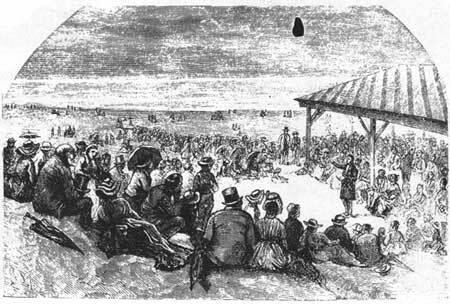 Founded 1869, evolved from summer camp meetings in which Methodist preachers spoke on beach to those who had pitched nearby tents. Attracted leading national preachers, group of clergymen formed Ocean Grove Camp Meeting Association to acquire land and operate summer camp meeting. By early 20th century, became known as "Queen of Religious Resorts," with wooden tabernacle erected in 1870s new site for sermons, religious services and choir concerts. Great Auditorium completed 1894 replaced earlier, smaller tabernacles, designed to accommodate audiences up to 10,000 people, later installation of theater-style seating reduced capacity to current 6,250. Auditorium features religious and popular programs, including nationally known singers, musicians and groups. Established 1968 as nonprofit Wheaton Village by Frank Wheaton, Jr., great-grandson of founder of Wheaton Glass Co. (later Wheaton Industries), at one time largest family-owned company in US. Wheaton Glass became leading producer of vials for laboratories, drug packaging, subsequently diversified into plastic packaging for consumer products. Museum of American Glass at Center houses most comprehensive collection of glass produced in America with 7,000 pieces, including from Wheaton Glass and other New Jersey glassmakers.. Located on 65 acres, also includes largest folklife center in New Jersey, hot glass studio, traditional craft studios, five museum stores, event center and picnic grove. Daily glass blowing and craft demonstrations, also features special exhibitions, programs, workshops, performances and several weekend festivals throughout year, including annual Festival of Fine Craft. Pinelands farm community which began with wild cranberry bogs converted to commercial production by James Fenwick in 1850s. After Fenwick's death in 1882, his son-in-law Joseph J. White expanded bogs and incorporated business as J.J. White Inc. in 1912, largest cranberry farm in New Jersey. By 1920s, farm also comprised field of experimental blueberry bushes and greenhouses, and main village including worker housing, general store, barrel-making factory and warehouse, cranberry sorting and packing plant, and other associated outbuildings and structures. Elizabeth White, White's daughter, along with William Colville, developed commercial blueberry by cross-fertilizing wild bushes to create new varieties with higher yields and disease resistance. 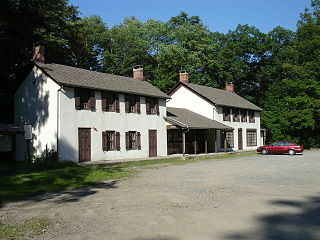 Property owned by state government, administered by Division of Parks and Forestry as part of Brendan T. Byrne State Forest and leased to nonprofit Whitesbog Preservation Trust, which seeks to restore and enhance land, historic sites and buildings and sponsors events and educational programs. Village includes some restored buildings, as well as several in ruins, extensive biking and walking trails. Origins from construction in 1787 by James Baremore f single-room building which served as stagecoach stop, later expanded as inn serving travelers to Absecon Island, which became site for Atlantic City. Inn abandoned in early 1900s as railroads dominated travel. In 1952, local philanthropists and artists Ethel and Fred Noyes purchased and restored inn, re-opening it as restaurant, in 1960s planned to expand site into a historical attraction similar to Colonial Williamsburg. Several historic buildings from around South Jersey brought to property, restored and converted into shops and attractions. Presently consists of a principal inn, rebuilt around original structure; two other inns, and 32 other authentic buildings typical of early South Jersey and restored to their original appearances. Village Greene" includes shops and activities such as paddleboats, miniature golf, carousel, and old-fashioned miniature steam train. Sections of property also developed for housing, including condominiums and retirement community.